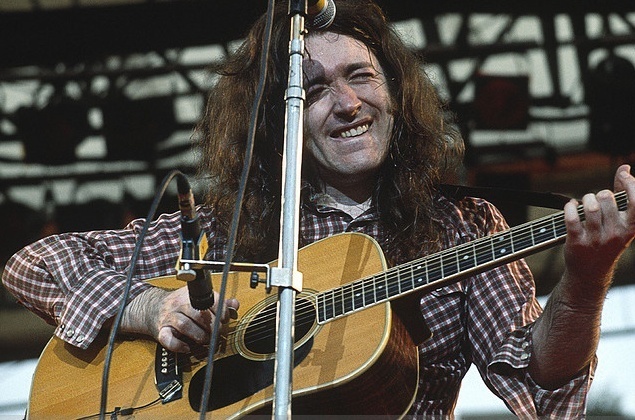 Rory Gallagher a écrit: got the Martin in 1969, second-hand. A guy traded it in for a banjo or something and he claimed he picked it off the line at the Martin factory in Nazareth —whether that was a sales pitch or not, I don't know, but it's a good Martin. It's not outrageous, but it's getting better. I had to get the whole bridge re-made because the intonation was bad when I bought it — other than that it's fine. I use Earthwood bronze medium gauge strings which are great — as opposed to the mandolin strings which snap like mad — and I have an lbanez bug on the bridge. I've tried it in other positions but it seems to be best on the bridge. That goes into a Barcus Berry pre amp — a standard one — I've tried the Mk. II with the tone and boost on, and I’ll probably get one of those. I like the lbanez just as much as the Barcus Berry, but the one advantage of the Barcus Berry is there's a guy in Belgium who has a Barcus Berry on his Gibson but he's got it underneath the soundhole, right under the bridge. It's screwed in so it's literally moulded into the bridge. The pressure of the screw is probably better than glue. The best thing about it is that you cant see it and you can also run a lead in and fix in a jack socket. Oddly enough, if you remember Lonnie Donegan years ago, he used to actually plug his guitar in and that was a Martin, so he must have had a De Armond or a microphone built in or something like that, and that was before any of us were doing these things! Maybe he had some kind of violin contact mike or something. My only crib with the D-35 is that the neck is a bit round as opposed to the V-shape like the D-28, but it does have a lot of bottom response I've heard better Martins but I've heard a lot worse. 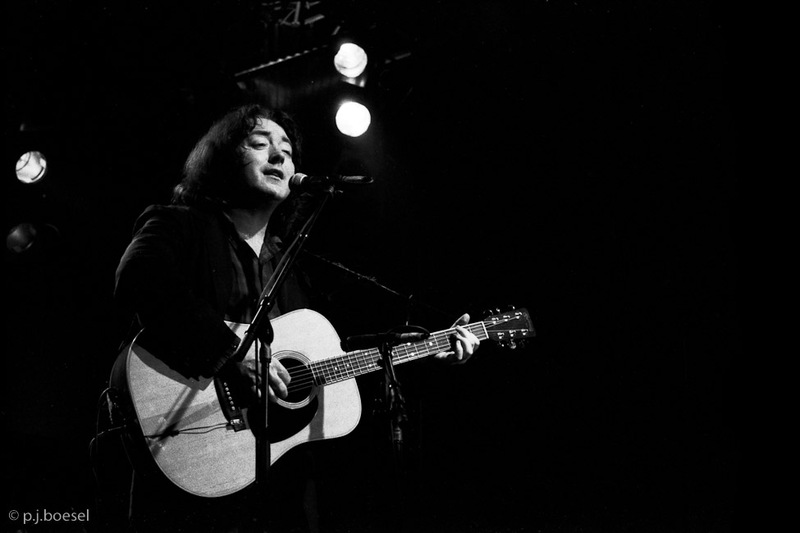 Rory with his Martin D-35 at the Chateau Neuf in Oslo, Norway in 1978. 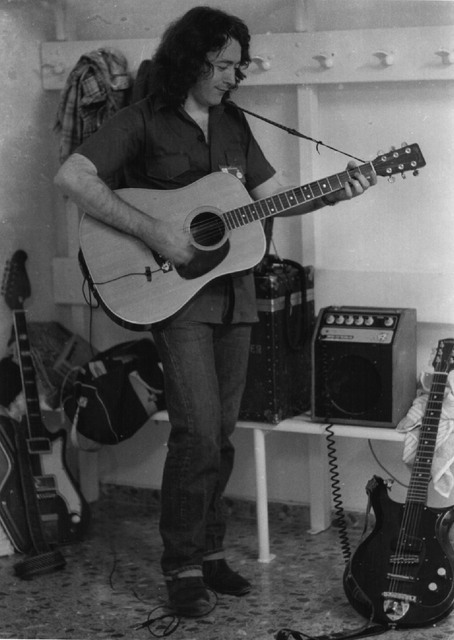 Rory Gallagher a écrit: The Martin D35 I got in London in '69. It's getting better. I had to get a new bridge part made for it because the intonation was, a bit peculiar, but it's OK now. Rory y est bouleversant de sincérité et on le sent en pleine possession de son art !!! Absolument, une émission produite par JN Coghe, et qui montre un Royr brillant et plein d'humilité. oulala pas moi !! heureusement que Rory c'est pas que ça sinon..
Rory réussit à satisfaire tout le monde: les amateurs, de blues, de rock, de hard, de folk, de musique celtique, et c'est notamment en ça que c'était un grand!